Do you want more leads, more traffic, expert marketing insights, brilliant B2B copywriting, a website that converts, or all of the above? We’d love to hear about your business and discuss how we can help you achieve your marketing goals. Looking to learn more about inbound marketing. Sign up and get six essential lessons in your inbox. We do websites! Find out about our growth-driven design approach to website optimisation. Get stuck into our blog. Try ‘How to do Keyword Optimisation’ for starters. Speak to CEO Matthew Stibbe using our call booking system. Fill in this form and all your dreams will come true. A real person will reply. If you like our style then you’ll definitely like our newsletter. Not the usual blah blah and we won’t spam your inbox. We’re a remote working organisation based in the UK. Sorry, there’s no office to visit, but get in touch and we may be able to visit you for a face-to-face meeting. We have a points pricing system, so you pay for tangible deliverables, not by the hour. We do one-off projects or longer-term retainers. Do I look like your client? We work with a diverse range of businesses, but B2B tech SMBs are our wheelhouse. We are good at translating technical jargon into human-speak. Are you the type of people I want to work with? We are! Honestly, we have a Chief Happiness Officer and we put a lot of work into our company culture. And, at minimum, we pay the London Real Living wage to all full-time employees. What can I get from working with you? Inspiring content, website design, lead conversion, SEO optimisation, social media engagement and a joined-up, data-driven marketing strategy. You look like you do a lot, what don't you do? 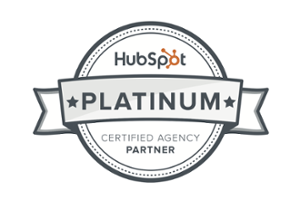 As a Hubspot Platinum partner, we’re an inbound marketing agency. That means we’re not an advertising agency (though we dabble) or a PR agency. We can help promote your events but we're not going to book rooms or serve canapés either. Can I put a guest post or advertise on your blog? We always welcome talented people getting in touch. If we’re advertising any job openings you will find them on this page.